It was my grandpa (Papa Walter) that introduced me to Papa Hemingway. From the moment I picked up my first book, he never stopped talking about For Whom the Bell Tolls. (Imagine 10-year-old me: “I’ve just read Harry Potter!” with Walter quickly waving this aside: “Yes but have you read Hemingway?”) Being a lover of writing, he wrote his own funeral memorial card years before he passed and quoted Hemingway. Anyway, it would have been his 80th birthday on Sunday and he loved a drink as much as Hemingway did, so it felt like a cracking tribute to visit his favourite author’s hangouts and drink to the pair of them. First up on the Hemingway tour, the Palace Hotel. He was known to have rested his head more than once, and later textualised the hotel for the Russians in For Whom the Bell Tolls. The Palace has now been taken over by the Westin. I love the Westin as much as the next person, but sitting in the bar trying to imagine Papa Hemingway throwing back a good few martinis is quite difficult when your table is next to the new (and admittedly very good) Chinese restaurant full of hotel guests. As hard as we tried, we couldn’t marry the imagine of Hemingway sitting in the bar gleaning republican gossip from the Russians, whilst battling the wafts of dim sum noodles. We moved on. Next stop, Hotel Tryp on Gran Via. (Calle Gran Vía, 25, 28013 Madrid). 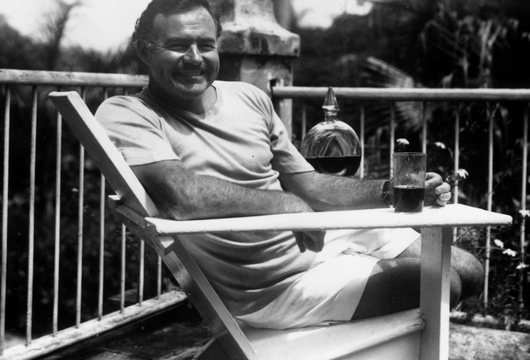 Hemingway was on the guest ledger several times, even more so on the hotel bar’s ledger. Lovely place and all, but I feel closer to Hemingway’s Spain in my local supermarket. After a look in, we continued to the next place. Feeling like a drink would be in order, on our way from Gran Via through the main square in Madrid, Plaza Sol, we stopped off in Casa Labra. As far as I’m aware, this was not a Hemingway haunt. 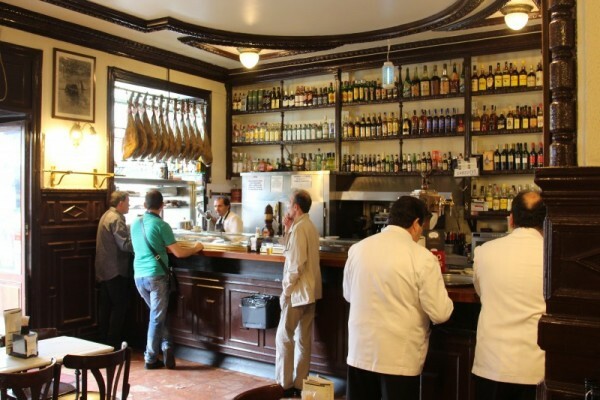 However, having opened in 1860 and being the birthplace of Spain’s Socialist party in 1879, it felt a lot closer to the kind of bars frequented by Don Ernesto (as he is affectionately known in Spain). We squeezed our way through the invariably busy bar and supped our drinks, plotting our next move. Spurred on by our cañas (local beer served in a small glasses so it does not get warm: the pequeño size shouldn’t worry you, there’s no judgement for drinking several), we carried on up the narrow streets to Plaza Santa Ana. Despite its previous reputation, Santa Ana is now home to many a trendy tapas bar. Pushing past the cocktail-sipping hen parties, we found our next stop. Cervecería Alemana. The bar is inconspicuously planted on the corner of the square. Happily, the bar itself has undergone very few changes since Hemingway was last thrown out of it. 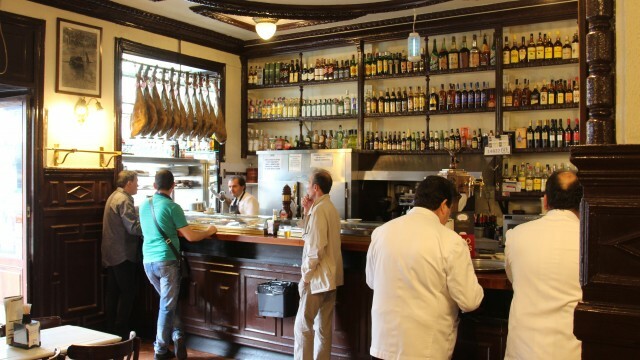 The menu remains the same (grilled prawns, battered cod, potato omelette and serrano ham), the drinks are strong and unaffected by trends: think beer, rum, vermouth, and Spanish wine. 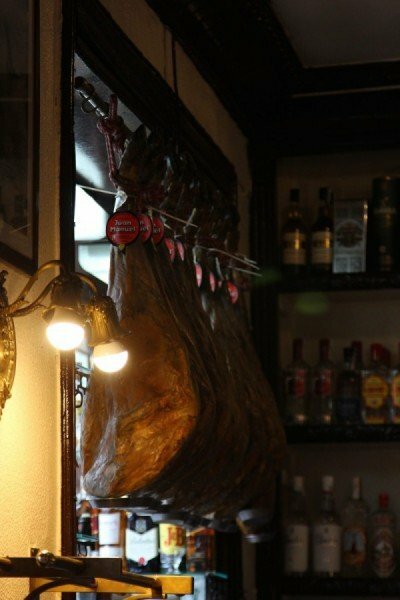 Hanging ham legs in the window and a selected of cured fish in pools of oil add to the traditional feel of the place. The waiters are also reassuringly classical; the entire team is made up of men in their late sixties dressed impeccably smart in white dinner jackets and bow ties. This is not a bar to betray its roots. My drinking partner opted for hot chocolate, which was instantly met with a wave of warm derision and a friendly blow on his back. He was encouraged to have a beer instead, a compromise eventually met via a tinto de verano (red wine with lemonade, which due to its innocent taste often results in the victim being felled in the afternoon hours). Once your drink choices have been approved, you can sit at Hemingway’s favoured table, and try and gaze beyond the sea of tipsy tourists, to imagine the sights he would have seen. The small window box has been adorned with a picture of the man himself, looking formidable, although the photo goes mostly unnoticed by the clientele who are far more concerned with barking their orders to one of the blithely unconcerned waiters. At this point the tour was fun, but we still weren’t getting a full sense of Hemingway’s Madrid. We went to the next place, La Venencia, which, as it turns out, is quite simply the best place ever. The bar was literally shitting character. It’s not the least bit gimmicky, it feels completely legitimate. There’s no picture of Hemingway, no sign, in fact, there’s barely a sign to the bar at all. However, in La Venencia, there are rules and they are strict ones. Rule no. 1: No photos. Ever. The rule dates back to the civil war when the republicans used the bar as a hangout. Photographic evidence could mean identification by the fascists, so all photography was banned. Now this was especially difficult for me, because I compulsively photograph my every move in order to compensate memory loss as I age. However, the bar itself is so full of life that I feel ever if I were to take a sneaky photo, it would never have done it justice. If you want to see it, you have to go. Rule no. 2: No tips. We were told this before we went in and, of course, forgot after many a drink. Harking back to republican days when the waiters didn’t accept tips to show their support for the principle that every man is equal, it is still a rule in place today. When we waved away our change, the waiter slightly but firmly shook his head and placed it on the bar. Rule no. 3: No spitting. Anyway more about the bar. It’s old. It hasn’t been touched since Hemingway stepped foot in it and it most probably wasn’t touched for a long time before. It’s long, narrow and sparsely lit with hanging lights, which appear to be the only modern addition. The rest of the place is planted firmly planted in Spain’s republican past. It serves sherry and only sherry. It has five different types of sherry (Jerez) in huge barrels behind the bar, which are decanted into smaller bottles and poured into generously sized glasses. There are nine types of tapas. Mostly meat, cheese, cheese with meat, and meat with cheese. You get the omnipresent free olives when you order a drink, which are also impossibly cheap. There’s a scattering of chairs and tables, but like most Spanish places, standing is preferred. You wedge yourself in at the bar and the waiter keeps a note of your drinks by writing in chalk at your standing place. This proved slightly confusing when the woman next to us, smashed not one but two sherry glasses, therefore erasing her own, and everyone else’s chalk bar tabs. Deliberate? No one seemed particularly annoyed at her. The funny thing is that while it’s a bar Hemingway frequented, and I can see why, it seems to be so much more than that. It’s a bar where republican strategies were talked about, where republican sympathies still live on, and this unites the patrons, giving you the sense you are not just entering a bar, but pledging allegiance. By drinking in this bar, you are making a bold statement and it’s a one that I like. In a bar like this, you’re drinking in the nation’s history, as well as its crop. To finish: The staff are pleasant, as are the patrons and everyone knows each other. People come and go and shout greetings to others in the bar who cheerfully reply. You get the feeling that this bar has its share of Hemingway-ites, but also its core group of patrons. It’s a group that I have now become determined to ingratiate myself with, and have already arranged my next visit.